As promised in my last post, I got some pictures of the spider garden at night. I’ve added quite a bit of webbing to the garden since the first day. A couple of nights of strong winds have done a number on the webs and made them look creepier. I also finished the porch and got some pictures of it. 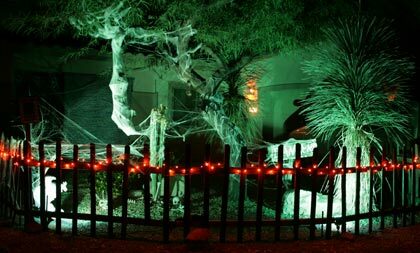 The spider garden at night, lit by two green floodlights and some orange LED lights along the top of the fence. 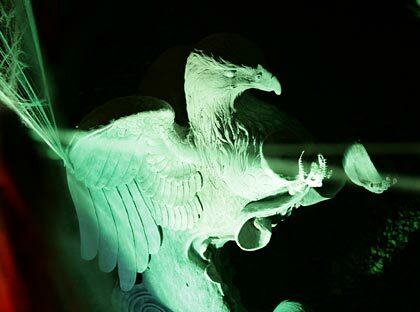 I added this gryphon gargoyle to the spider garden to keep one of the floodlights from shining into the porch. Nice lighting effect, I think. On Thursday, my friend Carol and I made some egg sacs for the spider garden. 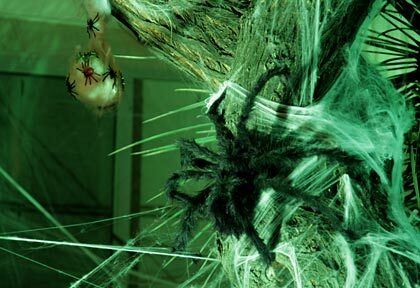 You can see one of them here, crawling with baby spiders, and the proud mother spider looking on. 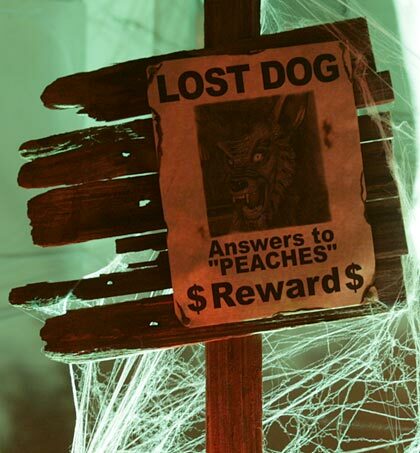 Hopefully, Peaches the werewolf will come home in time for Halloween. The spider victim, now named "Dingus McGee," and the spider who'd like to give him a hand. 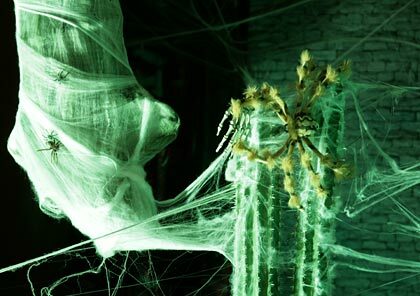 A medium shot of the spider garden at night. The orange light in the background is from an orange CF bulb inside one of our front sconces. A daytime picture of the front of the porch. 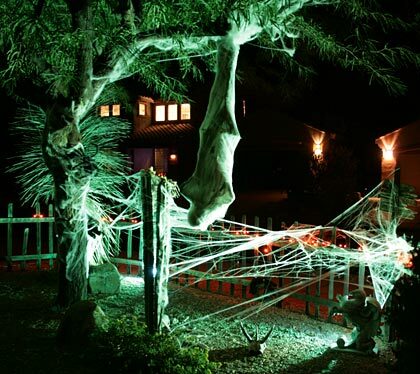 We'll add more webs and some spiders on Halloween day to prevent the wind from destroying them overnight. 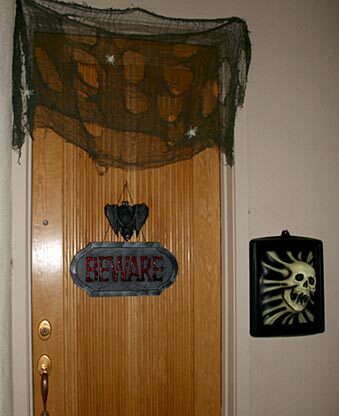 A flash picture of the front door. The front door (from the opposite angle) lit by two black lights and a few battery-operated tea lights. The bat's red eyes blink on and off. 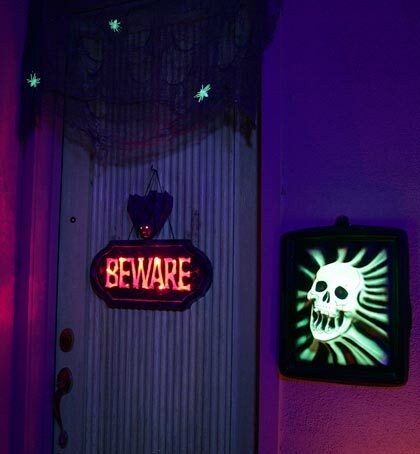 The "BEWARE" sign is sound-activated and can be set to just turn on the lights behind the words or turn on the lights and play scary noises. To the right of the door. The pleasant-looking fellow sitting on the bench is Steve; the neighborhood kids say he's an alien. Steve is ready for Halloween with his candy bucket. 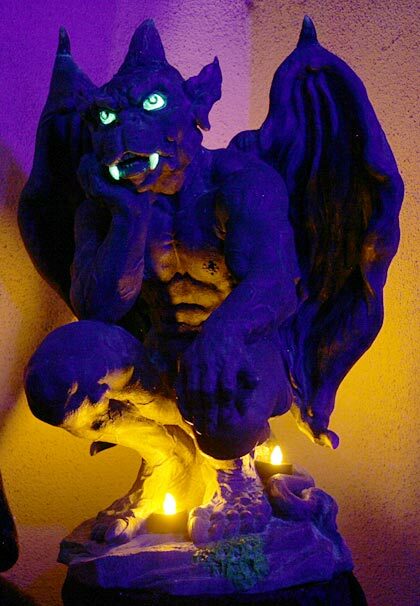 The gargoyle perched over his shoulder is Wally. 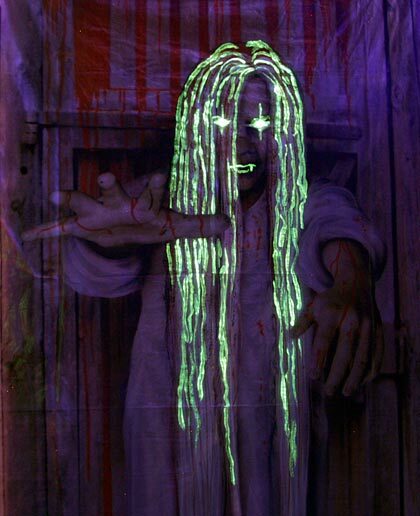 This picture is lit only by black lights and phony tea lights; the colors on the walls are cool but totally inaccurate. Steve's finger food - literally. 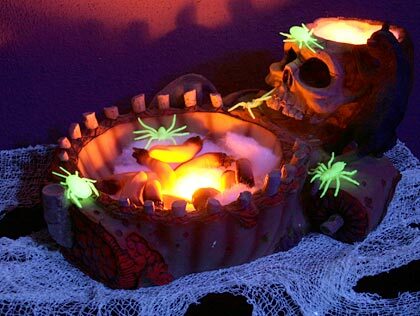 Yes, those are severed fingers surrounding the tea light in the bottom dish. Steve with his candy bucket and his fleecy Halloween blankie and "Boo!" pillow - just in case he needs to take a nap. Wally. I painted his eyes and fangs with glow-in-the-dark paint. He's underlit by three phony tea lights. 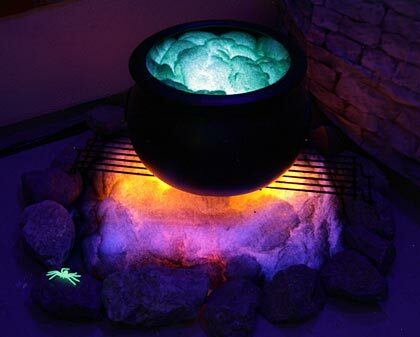 A cauldron of foaming, frothing, bubbly green goo sits over a banked fire in the corner of the porch. Yum! 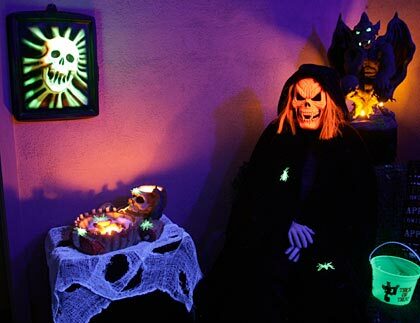 This creepy dude hangs over the cauldron. I touched him up with some glow-in-the-dark paint to make him stand out a bit in the darkness. 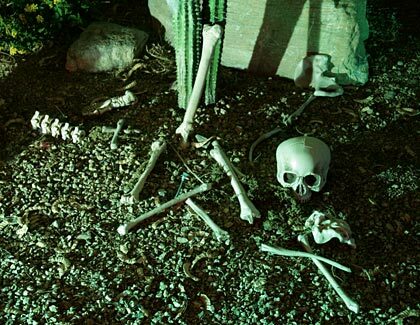 So that’s how things stand the night before Halloween. 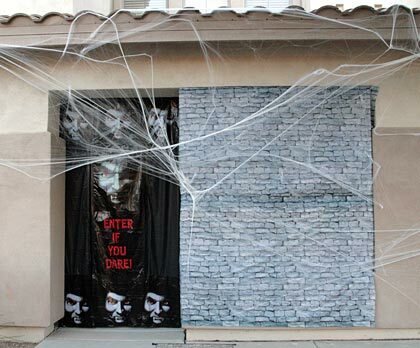 Tomorrow, before the trick-or-treaters (TOTs) arrive, we’ll be putting up a lot more web and spiders. Hopefully I’ll have time to get a few more pictures. If I do, I’ll post them along with any fun stories about terrifying TOTs and/or their parents. And, no, it’s NOT a haunt. 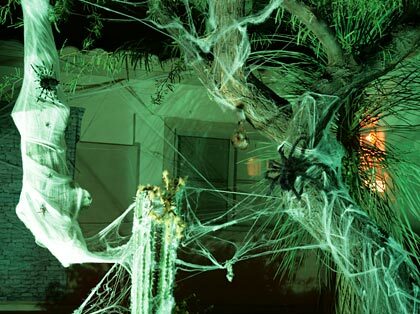 It’s just some yard decorations and a scary porch. Really. Still not a haunt, though. 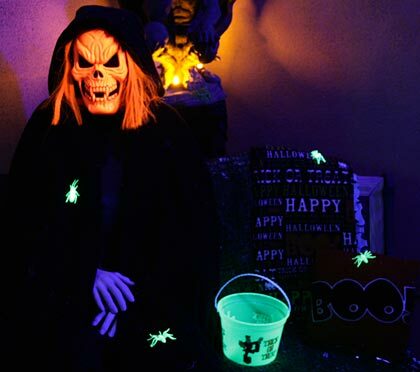 This entry was posted on 30 October 2010 at 10:58 pm and is filed under Halloween, Haunts, Photos. You can follow any responses to this entry through the RSS 2.0 feed. You can leave a response, or trackback from your own site.